This day has been sour from early this morning. First, I spent a good 15 minutes arguing with two of my students in first period about why a certain character in a story was not round. Then I don’t even make it into my driveway before my neighbors approach me. They are nice girls but they come over way too much and don’t get the hint when I want them to go. So they come inside and of course, don’t go back home for 2 hours. Even though I’m cleaning the house or putting Kanan down for a nap or talking with future renters who are checking the house out, they stay. To top it off, Kanan is in the grumpiest mood I have seen in a long time. Nothing is making the kid happy. I don’t know if it is teething or a tummy ache or what. Mike then decides he is too tired for us to go to my sister’s neighborhood to trick or treat. So I decide to atleast put Kanan in his costume and take some photos. Kanan hates the costume and starts crying hysterically the second I start putting it on him. Every photo of him is of him crying . Luckily he is cute, so even a crying skunk is better than no skunk pictures. So after I take the costume off of Kanan, and start getting him ready for bed, he miraculously cheers up, but Mike passes out on the floor. After 45 minutes of sleeping on th e floor of Kanan’s room, he gets up long enough to give Kanan and a kiss and then disappears. After I finally get Kanan in bed and sleepy, I come out of the bedroom starving and hoping Mike is starting something for dinner since we went to the grocery store last night and bought a bunch of groceries and even meal planned. There is no one around. I go into our bedroom and he is asleep. He didn’t even eat dinner. So here I am on Halloween night. No trick or treating, no fun dressing up, everyone is in bed but me. There are not even trick or treaters knocking on my door for treats to cheer me up. The neighborhood is dead. I guess everyone left for the neighborhoods with the big candy bars or something. Anyway, I’m eating a microwavable burrito and feeling sorry for myself. Grrrrrrrrrrrr. 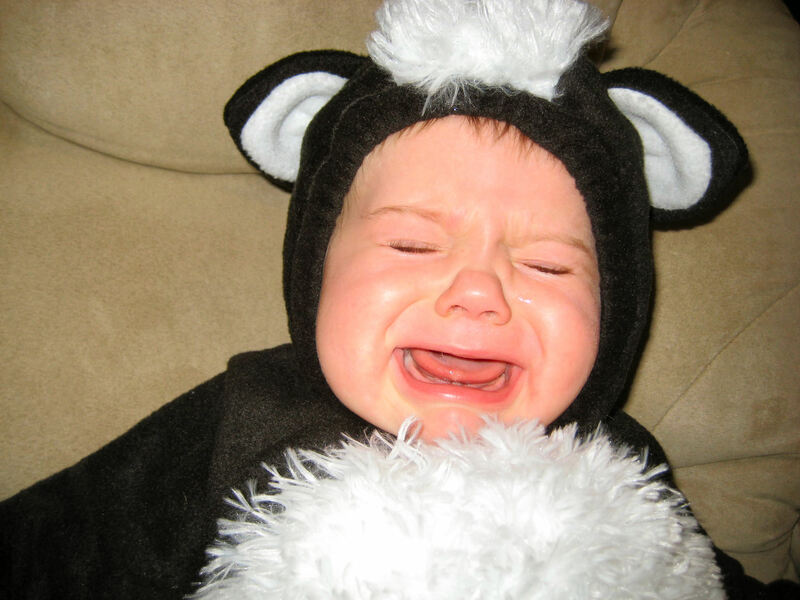 I’m so sorry your halloween turned out so crummy, but you’re right, a crying skunk is better than no skunk. Ya know, if you could have made it out to Barbies neighborhood for trick or treating, it would have really been about what you got out of it and not Kanan at this age. Some days ya just don’t get a very good rate of return on investment. yeah burritos ! 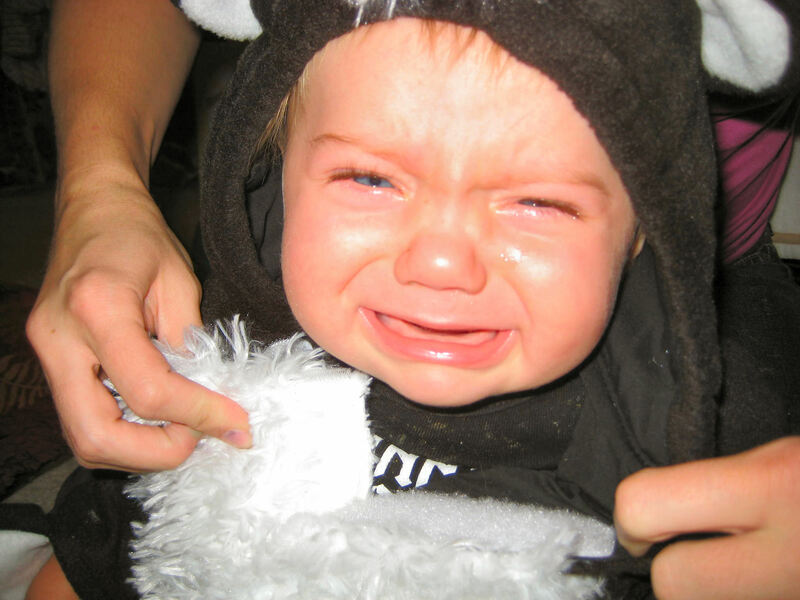 I’m pretty sure this is what my baby has looked like for the past few days . . . even without a costume. Sheesh. I can’t wait to get together and commiserate. I have a little something for Kanan, too, and I’d love to get together soon. My mother-in-law’s coming to stay on Wednesday for a week and we have multiple doc appointments this week, but after that we should be free. Thanks for the comments; I’ve had fun getting the blog started finally.